Squirrels can be a menace in your yard. After working hard on your flower beds, herb garden or simple foliage, it’s exhausting to find squirrels uprooting your lawn. The gray squirrel is one of the usual suspects. With a light belly, and overall gray, tan or black color, this squirrel can be identified by the bushy tail it uses for warmth and balance. This animal loves fresh fruits, vegetables and flowers, and they tend to uproot spring bulbs and steal food from bird feeders. To prevent the damages caused by squirrels, it’s time to correctly identify and manage the problem. Why are there Squirrels in your Yard? Squirrels become active in autumn, as they try to forage for food to keep for the winter. This includes gathering acorns and fruits, pinecones, fungi and even insects. Nothing is safe from squirrels, not even your yard. They want to hoard accessible food and stash it. What’s worse it that they bury their stock, and they usually dig holes in your yard as well. How can you get rid of Squirrels? Keeping squirrels off your yard involves correctly identifying the species of the squirrel. You can do this by consulting online references or by contacting a pest control professional. After correctly identifying the squirrel pestering your yard, you can use a number of techniques to minimize its actions. First, use repellants. 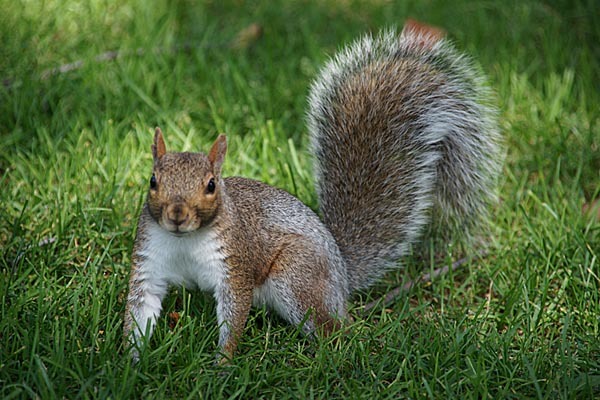 There are natural and chemical repellants that you can use for a variety of squirrel species. Natural repellants involve using household and kitchen items. You can bury orange and lemon rinds under the surface of the soil, or sprinkle coffee grounds. You can also plant cloves of garlic or sprinkle cayenne pepper. These scents naturally repel squirrels. Second, you can implement a trapping mechanism. Use small traps that are sturdy and placed in shadow. However, this technique is not 100% effective as it only covers a small portion of the large squirrel population. They might just keep coming back if you don’t use repellants and other preventative measures. Thirdly, you can flood their burrows. Make sure that the squirrels don’t think of your yard as an attractive place to stock up for winter. These ground squirrels would much rather look for drier ground elsewhere. Fourth, you can enact preventative measures. Clean up bulb debris, which attracts squirrels to your yard. Place your birdfeeders high up the ground, around 5 to 6 feet, to prevent ground squirrels from stealing the feed. You can even buy a squirrel-proof bird feeder, which is designed to eject pests and even shock the creatures. Another preventative measure is to pack the ground down after planting. Making soil compact means it’s more difficult for the squirrels to dig up the plants and to dig burrows. Finally, getting rid of squirrels successfully may require a consultation with a local pest control professional. Keep the squirrels of your lawn once and for all. Written by BugOut Pest Control & Lawn Care. BugOut Pest Control & Lawn Care offers the best service for pest control in Columbia, MO.